The Phrygian dominant (Middle Eastern) scale I.
I have read that there is a so-called Phrygian dominant scale. Is that true? If so, what do I have to know about it? Question: What is the fundamental difference between the basic scales and the harmonic minor scale degrees? The teacher's explanation: "While each basic scale constitutes a basic tonality, where the relevant scale is the first degree and the next one is the second etc., only the first harmonic minor scale degree can function as a basic tonality." They can actually understand that all the seven basic scales could work as basic tonalities, whereas only the minor degree of the harmonic minor scales degrees could be a basic tonality. That's just enough for them to know for the beginning. 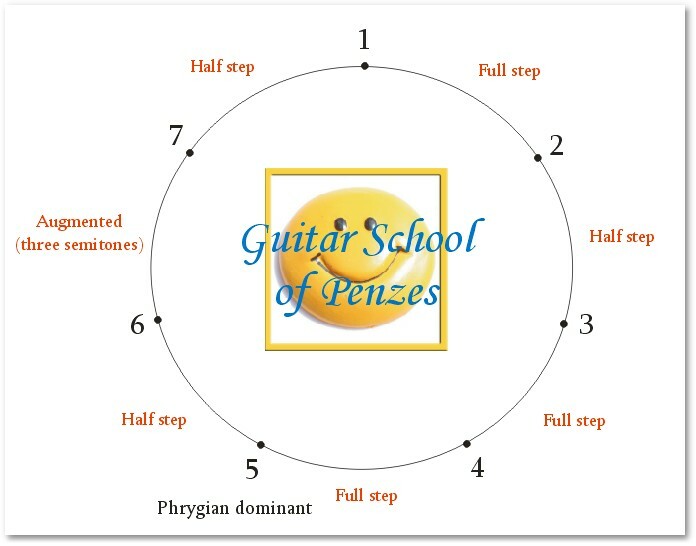 Only later on, when they have fully comprehended and practiced the scale degrees, can they learn that there is another harmonic scale degree that could be used as a basic tonality; this is the Phrygian dominant scale (the fifth harmonic minor scale degree). The Phrygian dominant scale is a variant to the normal Phrygian scale, and its position being the fifth degree from the minor scale degree makes it a dominant scale (according to the T-S-D-T or I-IV-V-I pattern). Obviously, this is where the name 'dominant' derives from. Yet, calling it simply the Phrygian dominant scale would not be a good choice, for one particular reason; it would still refer to the obvious relation to the harmonic minor. And we don't want that, since it is a completely different tonality. What should we call it then? My name suggestion is the Middle Eastern Phrygian scale, as it is extremely common in the Middle Eastern music. So I will just end up calling this scale the Middle Eastern scale, and teaching my kid how to play it when he gets there. The chart perfectly describes the relation between the Middle Eastern Phrygian scale and the harmonic minor. Let's watch the following video, where I attempt to improvise over a nu-metal backing track, using B Middle Eastern Phrygian scales.